The Michigan Department of State is launching a new computer system that will provide you with improved services online and at all Secretary of State offices. We call it our Customer and Automotive Records System or CARS for short. The new system begins operation Tuesday, Feb. 19, 2019, and includes services for vehicle owners and automotive-related businesses. The second phase, expected to be introduced in February 2021, will include driver’s license and ID card services. CARS will enhance services for Michigan residents by adding new online options, improving existing online and kiosk services, and giving staff a more efficient tool to look up vehicle information and process transactions. CARS updates records in real time and replaces antiquated 1960s legacy mainframe technology that has impeded the department’s ability to optimally serve customers. Secretary of State branch offices, online services and auto business transactions will be taken offline and unavailable from Friday, Feb. 15, until 9 a.m. Tuesday, Feb. 19. The seven Super Centers usually open Saturday will be closed Saturday, Feb. 16, for the system-wide conversion. All branches will be closed on Presidents Day (Monday, Feb. 18). For a few weeks following the launch, as staff gets accustomed to the new computer system and adjusts to a different process for handling transactions, service in offices may take longer. Customers are encouraged to use CARS e-Services at ExpressSOS.com or to complete their transactions outside this timeframe. Late fees will be waived for transactions with expiration dates between Feb. 11 and March 2. 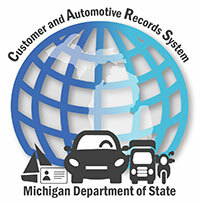 We appreciate your patience and understanding as the department modernizes its vehicle record computer system. Auto dealers, repair facilities, mechanics and driver education providers and instructors also will be able to perform many business and professional licensing transactions online. Real-time data updates also will enable transactions the old system would reject because of delays in the exchange of data with branch offices. Advanced security features will prompt online customers to create a user ID and password using MILogin, which also can be used to access other state government services in Michigan. You still will be able to renew a vehicle registration without a password if you are just doing a quick renewal, as is currently the case. A single record for each customer lists all their vehicles and other items. Branch employees won’t have to search through multiple separate databases to pull information together to complete your transaction. Transactions will be tracked in real time, and notes and scanned documents can be attached easily to customer records. Self-service kiosks now will offer watercraft registration renewals, in addition to the current license plate tab renewals. You will be able to order an instant title at any office. In February 2021, the CARS project will unveil driver-related transactions and services. The same straightforward functionality and access made available for vehicle transactions will be provided for all driver-related tasks online and at Secretary of State offices. Tens of millions of driver and vehicle records will be securely combined into one integrated customer record system.